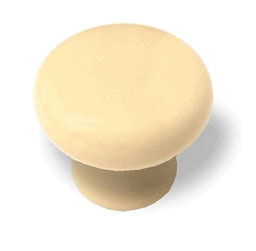 This Amerock Knob has a very persuasive bone finish, but is actually ABS plastic. Amerock quality. Diameter: 1 1/4 (31.75 mm) Projection: 1-1/16" (26.99 mm) Material: Plastic, Bone Comes with wood screw no thread insert Amerock Product Guaranteed Lasting Beauty"